Male has the large dorsal fin with small round light spots for display purposes and a gonopodium fin. Female is larger and rounder bellied. A generally peaceful fish but males will chase females of both this species of Molly and other livebearers. Best kept with robust but not aggressive tank mates. They should be kept in the ratio of 1 male to 2-3 females. Ideally should not be kept with long-finned fish as Mollies can fin-nip. Eats vegetables mainly, including algae. Will eat a wide range of food including flake and pellets, shrimp, bloodworm and brine shrimp. These fish require a large spacious tank with plenty of open swimming space and hiding places. They do best at lower-end brackish rather than freshwater. Keep them in salt-free water can lead to the Shimmies. Generally peaceful fish, males will chase females. Are known to eat their own fry. Looks very like Poecilia latipinna. But the male of P. velifera has a larger dorsal fin with pearly spots. One of the most attractive and largest of the Mollies commonly available. 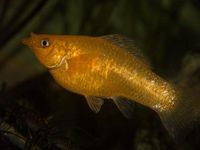 This fish breeds with other Molly species and so there are lots of hybrid versions of this fish which have different dorsal and caudal shaped fins, varieties of colour forms, as well as different lengths of body.